A chillaxed day at a favourite camping ground was the basis of this beautiful summer wedding. Ashlee and Curtis wanted a simple and intimate wedding with only family and friends and lucky for them, they are among some very talented and helpful people. All the small details of this wedding were taken care of by family and friends! Hair and makeup, the cake, the flowers, the list goes on... everyone came together for the couple they love to make this day both beautiful and special, which is so lovely to see. I absolutely loved my dress, when I tried it on I knew I was going to be wearing it and didn't even want to bother looking at any others. I loved the detail of the lace and the way it curved in and poofed out at the bottom. Everything I wanted and more. 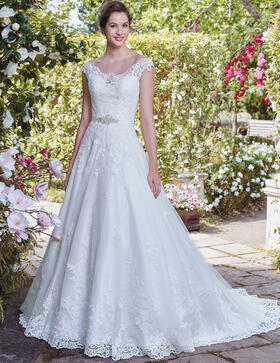 Ashlee purchased appliques from Rebecca Ingram (via Astra Bridal!) and had the keyhole at the back of the gown filled in.